In less than an hour after our Air Vistara Flight was taxied to the runway for a take off from Terminal 3 of Indira Gandhi International Airport in Delhi- India, all I could see from the window seat of the flight was endless ranges of snow-covered peaks extending to as far as my eyes could reach. Though it would have been ideal to drive all the way to Leh to get better acclimatized to the high altitudes, I could not resist the temptation of witnessing the majestic Himalayan ranges from the air. The sun had risen just a little above the horizon. The contours and ridges of the Himalayan ranges glistened like gold in the morning sunlight. The turquoise blue water of river Indus that snaked in between the mountain valleys stood out against the barren brown of the valleys. The entire view looked like a picture out of a fantasy novel. It looked too beautiful and too different to be real. However, in the days to come, I realized quite well that the region of Ladakh and Nubra which encompassed mountains, valleys, deserts, and plateaus was like no other and it was mysterious in more than one way. Leh is a prominent city located in the Ladakh region of the state of Jammu and Kashmir in India. It has for ages been a center of congruence of major trade routes between China, Tibet, India, and Kashmir. 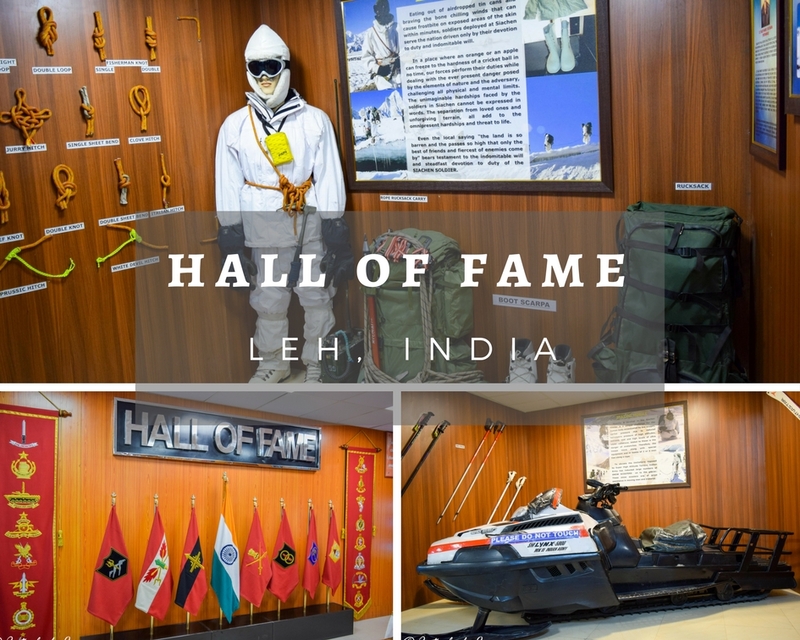 While Leh is considered as a base to explore some of the most amazing destinations of Ladakh, it is worth noting that Leh in itself is a destination that deserves to be explored and experienced. Whether you are a spiritual person, or a patron of arts and crafts, or an avid shopper or just someone in search of a gastronomical delight- the hinterland of Leh has something to cater to your interest. The humble palace of Leh built by the Namgyal Dynasty during the 17th century resembles the architecture of The Patola palace of Lhasa. Perched on the slopes of a dusty hill and standing 9 storeys high, the palace was home to the royal family until the 18th century after which the family fled to Stok Palace fearing the Dogra forces. Unlike many Lavish Palaces of India, the Leh palace lacks luxury. It is built of basic materials like mud, stone, wood, and sand which help in warding off the sudden variations in heat and cold that are very typical of the Ladakh region. Walking in the nondescript halls of the Leh palace, you would surely wonder about the hardship the builders would have undergone in erecting a magnificent structure in the harsh terrain of Ladakh. While at the Leh Palace, make sure you do not miss the panoramic view of the city of Leh and the towering mountain ranges surrounding it from the top floors. The white dome of the Shanti Stupa located on a hilltop in Leh stands out majestically amidst the dusty streets and mud buildings of Leh. Though the Shanti Stupa has been the latest addition to the landscape of Leh, it has become one of the most visited and photographed locations in Leh because of its beauty and elegance. The stupa was built in the year 1991 by a joint collaboration of Japanese and Tibetian Buddhists as part of the world peace mission to commemorate the 2500 years of existence of Buddhism in the world. It is impossible to not notice the beautiful white Stupa from different vantage points in Leh. Plan your visit during the full moon to witness the enchanting beauty of the Santhi Stupa illuminated by the silver moonlight. The local markets and bazaars of Leh are awash with shops- big and small selling artifacts, textiles, curios, statues, and jewelry. It won’t take long to get completely overwhelmed at the kind of articles put on sale. Intricately carved silver jewelry, colorful Tibetan flags. ornate statutes, prayer bells and wheels, precious jewelry, pashmina shawls, carpets, handwoven rugs, stoles, Ladakhi dresses and jewelry, turquoise artifacts, masks, paintings, woolen garments- there is something suiting every budget for you to splurge on. The empyrean landscape surrounding Leh is dotted with many Buddhist monasteries which have been the centers of culture and spirituality. No wonder, the hinterland of Ladakh is referred to as Mini Tibet. Most of the popular monasteries are located on hilltops on the banks of river Indus and offer a breathtaking view of the Himalayan peaks and the green valleys. 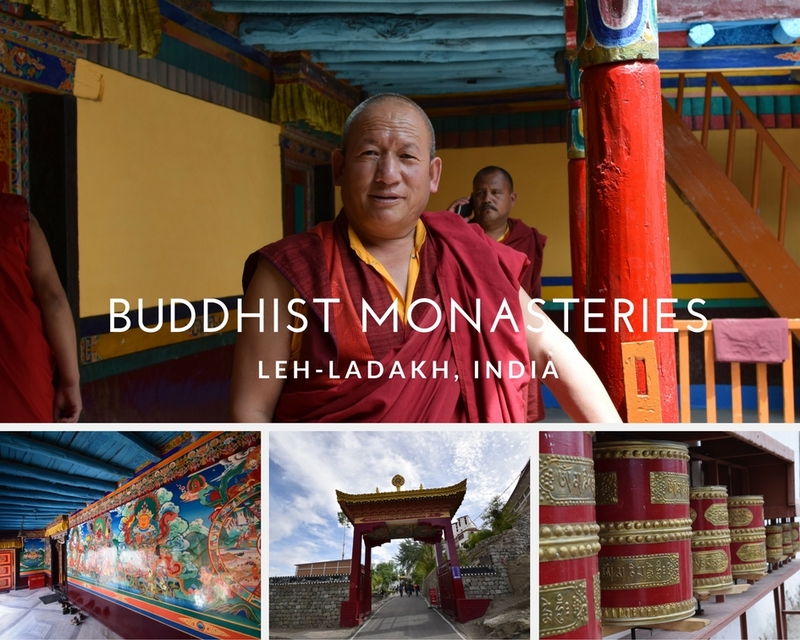 The rhythmic chants, colorful wall paintings, intricate mandalas and the spartan life of the monks in the monasteries is sure to lure you into a different world. However renounced of worldly pleasures the monks seem, it is intriguing to see them don Rayban glasses, Reebok shoes and use the latest technology gadgets. Thiksey, Stakna, Likir, Hemis, and Spituk are some notable monasteries which are at a close distance to Leh. Plan your visit to coincide with some of the Ladakhi festivals to witness local culture, celebrations, and traditions. The Magnetic Hill is a small stretch of road located along the Leh-Kargil highway which is believed to defy gravity by pulling a stationary vehicle uphill. The locals believe that the road was once a pathway to heaven where the deserving souls would get pulled to the path and the undeserving once could never get through. A more scientific reasoning is that the hills surrounding the region have strong magnetic forces which pull vehicles uphill. However, our cab driver was quick to demonstrate to us that the road actually goes downhill and it is an optical illusion caused by the surrounding landscape and the hills that gives a feeling that the road goes uphill. Nevertheless, the location is extremely beautiful and makes for a good photo stop. The Pathar Saheb Gurudwara located along the Leh-Srinagar highway is a shrine constructed to commemorate the visit of the Sikh saint, Sri Guru Nanak Dev to Ladakh. The chief deity of the gurudwara is a Stone mold which is believed to have a negative impression of Shri Guru Nanak consisting of his head shoulders and backside. The Gurudwara is built at the location where Shri Guru Nanak Dev had rested while returning to Punjab after visiting Tibet, Sikkim, and Nepal. It is currently managed by the Indian army and the langar offers food to hungry travelers at all times like it is done in many Gurudwaras. 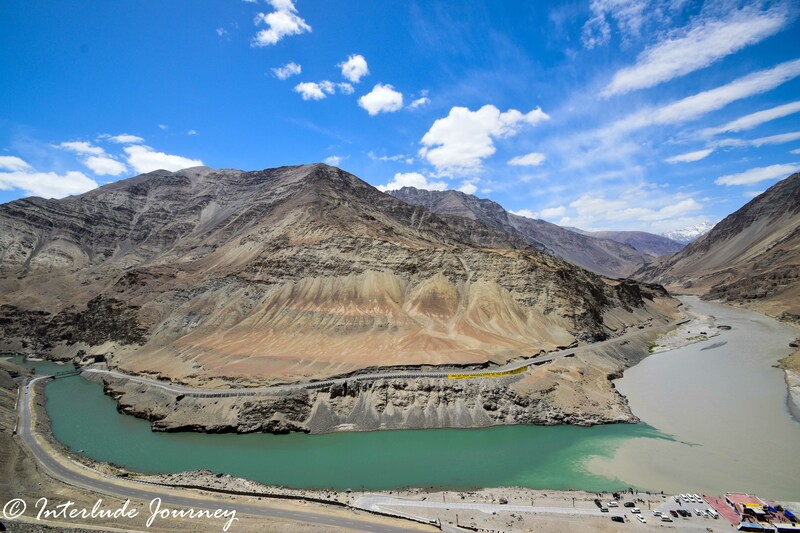 The confluence of the Indus and the Zanskar rivers in the dusty valleys is one of the most beautiful sights to behold. The two mighty rivers with different colors merge at the point of confluence to flow in unison thereafter. Owing to the nature of the soil along which the two rivers flow, they have remarkably different colors at any given time of the year. Standing at a vantage point, you can clearly see how the water of the two rivers merges in an unusual way owing to the difference in densities. If you are an adventure junkie, you can also try rafting in the chilling rapids of the Zanskar river. If you happen to visit Leh during winters, you can also try trekking on the frozen Zanskar river. The influence of Tibet on Ladakh also extends into the regular food habits. Meat and locally grown vegetables and grains form the staple food throughout Ladakh. With the influx of Indian and foreign tourists, the food culture of Leh has evolved making way for many multi-cuisines hotels and restaurants. However, no cuisine can beat the comfort provided by the local preparations at high altitudes and cold temperatures. 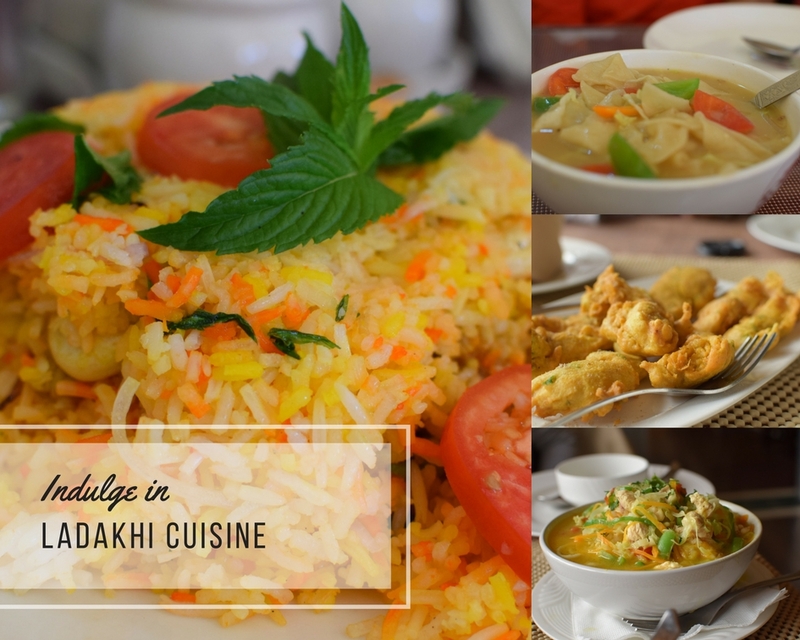 So, while you are in Leh, binge to your hearts content on the local dishes such as Thupka (noodle soup), Momos, Skyu (pasta with veggies) and Ladaki Pulao. Beat the bone-chilling low temperatures at the high altitude desert land of Ladakh as you multiple cups of Kashmiri Kahwa. This green concoction originating from Yarkand valley in Xinjiang Area of China and made from boiling exotic spices, Kashmiri green tea, saffron, and assorted nuts is nothing less than an elixir that keeps you warm in the dipping temperatures. It is caffeine free and yet has the ability to boost concentration and immunity because of the rich spices infused into it. The fact that it aids in digestion has resulted in the practice of having Kahwa after meals in most of the Kashmiri households. That was my take on the experiences you should not miss while in the hinterland called Leh. What has been your favorite experience in Leh. Are there any experiences I have missed? Nice to see you pen your travelogues of distant land. Leh and Ladakh is zenith for bikers and nature lovers. Good rewind of your journey to Leh and tips. Wow! Leh seems like an exceptional place to visit and explore. When is the best time of the year to enjoy this experiences? Hi Agness. Leh is accessible throughout the year. I would suggest 3 trips to Leh- one during spring, one during autumn and one during winter 🙂 The attractions are open all year round. Leh is most famous hill station of india and it is full with beautiful things. Natural things are best to enjoy here and Great photos you shared of that destination. I had celebrated this new year in Leh with my friends. It was my wonderful experience and we exploring leh in -15degree temperature. I wish I could share my photos of Leh here. Thank you. Thanks for sharing your Leh experiences. Leh is most famous hill station in India and it is full of beautiful things. The visitors explore the unique architecture of the leh palace. It is the famous hill station that filled with the beautiful things. It is nice to spend time. I was in Leh for just a couple of days. Went there for some work. Sadly missed most of everything. Need to go there again, and see the entire Ladakh. It is a fantastic place. Something interesting for everyone for sure!We had a lovely family holiday there in April this year!